Women’s History Month: Caroline Herschel #WHM16 #WomensHistoryMonth #WomenInSTEM « Adafruit Industries – Makers, hackers, artists, designers and engineers! 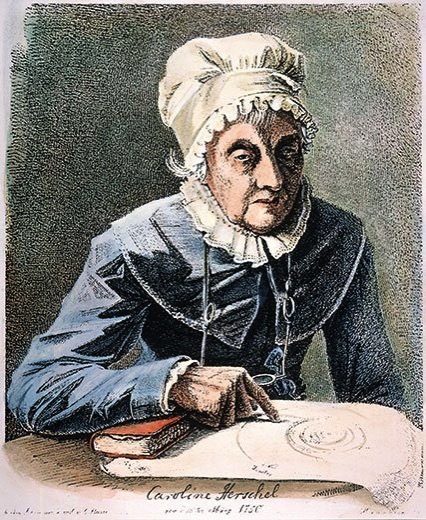 German born Astronomer Caroline Herschel‘s impressive career spanned both the 18th and 19th centuries. She went from her parents’ house maid to world class astronomer in a matter of decades. After moving to Britain, she began working alongside her brother, eventually becoming the UK’s first paid female astronomer as well as the first of her gender to discover a comet. Herschel was little more than the household drudge for her parents in Hanover, Germany (she would later describe herself as the “Cinderella of the family”), when her older brother, William, brought her to England in 1772 to run his household in Bath. After she mastered the art of singing—to accompany William, who was the organist for the Octagon Chapel—her brother switched careers and went into astronomy. Caroline followed. In addition to assisting her brother in his observations and in the building of telescopes, Caroline became a brilliant astronomer in her own right, discovering new nebulae and star clusters.